As I left the hotel, I took some photos of it. Below right is the excellent mural they had in the hallway. 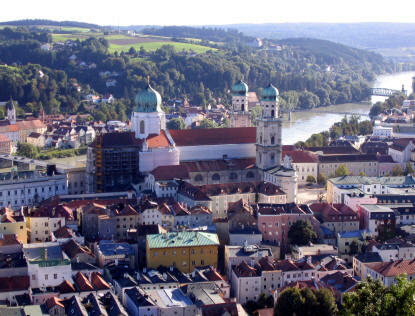 Passau has a population of around 50,000 and an additional 8,000 when the university is active. It is situated at the point where the river Inn and the river Ilz meet the Danube (Donau), and for this reason it is often called the "Three River City" (Drei-Flüße-Stadt). It lies around 1,243 miles (2,000 Km) from the end of the Danube, and has a small but thriving local tourist trade. This area was first settled by the Celts, who lived in southern Bavaria prior to the Romans coming. They came and founded a fortress here because of the excellent strategic position of the peninsula of Passau. The fortress grew and Passau became a real city. The economy was based on the salt business with nearby Bohemia (now called Czech Republic.) The salt came from Bad Reichenhall near Salzburg. In the middle ages, Passau's St. Stephens church was the head of the local church district which extended all the way to Hungary. Most of the old buildings survive today and are in active use. 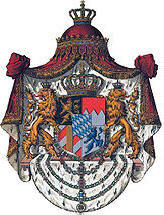 Like much of Bavaria, it's also predominantly Roman Catholic. On that note, at 12:20 Marcia and I walked the short distance to the Dom. It took 10 minutes and then we went inside Dom St. Stephan. 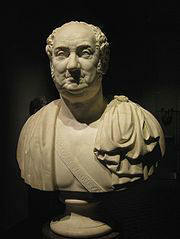 Marcia bought 2 CDs of their organ music and I got a statue of the Dom. Below is a stock photo in winter on the left and one I took on the right. See the clocks in the upper towers? Here they are when zooming in. On the left (below) is a shot from midway down the main aisle and on the right is the apse taken from just in front of the altar. It is really quite beautiful. 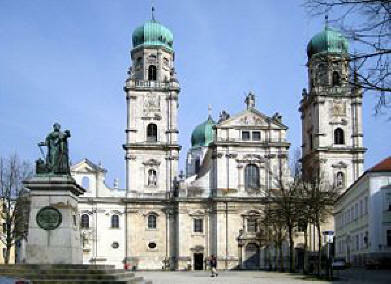 St. Stephan's Cathedral, or "Dom St. Stephan" in German, is a baroque church that is the seat of the Catholic Bishop of Passau. There have been many churches built on this site since 730 and this current cathedral is 328 ft (100 m) long. It was built between 1668 and 1693, after a fire destroyed its predecessor in 1662. Only the late gothic eastern side remains. The cathedral's architect was Carlo Lurago, the interior was designed by Giovanni Battista Carlone, and its frescos by Carpoforo Tencalla. Over time, the Passau Cathedral acquired the largest organ outside of the US and is the largest cathedral organ in the world. It has 17,774 pipes and 233 registers, all of which can be played with the five-manual general console in the gallery. Once outside we walked around the Platz to look at the statues. In the center of the square (above left) is the statue of the Bavarian King Maximillian Joseph I (1756–1825) (below left.) 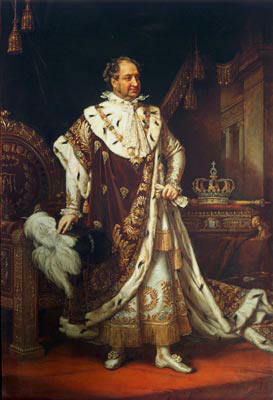 Here is a portrait of the King in all his royalty along with his bust and the family coat of arms of the House Wittelsbach. This fountain in the courtyard was rather interesting as well. We then walked all over the old city seeing many buildings and street scenes. I decided that this is really a very nice town to spend time in and would love to come back. We even walked by last night's restaurant, the Heiliggeist Schenke. When we were done touring at 12:50, I took my run through the city to Dreiflüßeck Park, the very tip of the peninsula where the rivers meet. It was nice running along the river. Above and below you can see the Turm or tower with its little passageway. I ran by the Stadtmauer or city wall (below) which was erected in 1250 and reconstructed in the 16th Century. Excuse the dumper. ....then I turned around 180° and took this shot looking at the confluence of the three rivers becoming the Danube and flowing away. I was finished and at 1:40 sat down for a cappuccino at a little place I found called Piccollo Italia [Heuwinkel 10, +49-(0)851-37211.] I got back to the hotel, packed up and at 3 PM we checked out of the hotel. Now that the car was loaded we left it in their garage and decided to stroll back to town so Marcia could have lunch. On the way I bought 3 pins and at 4:10 I had another cappuccino at Cafe San Paolo [Rindermarkt 4, +49-(0)160-345-7887] in the Altstadt. At 5 PM Marcia had a lunch of Sparglesuppe (asparagus soup) (below right) at the Hotel Zum König [Am Rindermarkt 2, +49-(0)851- 93-1060]. It was really nice on their veranda with the forest to look at. As we left I noted this display of Austrian wines in the hallway of the hotel. We walked back to our hotel and I wanted to look inside the little pink church just across from our hotel. As I walked over to the church, Pfarrkirche St. Paul, there was a class outing and they were totally enrapt by the program being presented. The church was based on previous churches starting in 1050 and this latest church was built from 1663 to 1678, a hundred years before our revolution. Below is the altar of the church (left) and an unusual statue of Christ in hand and leg cuffs behind a cage, an event I do not remember from the New Testament. We then got the car and at 5:20 PM, we drove across the bridge and up to the top of the mountain to tour the Veste Oberhaus museum (left, below left) [Veste Oberhaus 125, +49-(0)851-493-3512.] Unfortunately, it had closed at 5, but we still had the opportunity to see the amazing view over Passau (below right, stock photo) and see the three rivers. Below are PhotoStich panoramas I took of the city and a stock aerial photo of the Dom. 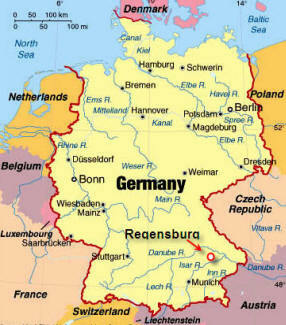 At 5:45 we headed out and Marcia drove the 75 miles directly northeast to the city of Regensburg. It only took a little more than an hour. We arrived in Regensburg at exactly 7 PM and checked into the Park Hotel Maximillian, [Maximillianstraße 28, +49-(0)941-56850.] While we were getting our bags unloaded we met Hans Drobesch from an Aluminum company from Vienna, but he is stationed in San Diego. After getting settled in and unpacked, I took a shot of the entry courtyard (above left) and the view down the street (above right.) We then headed out for dinner at 8 PM. 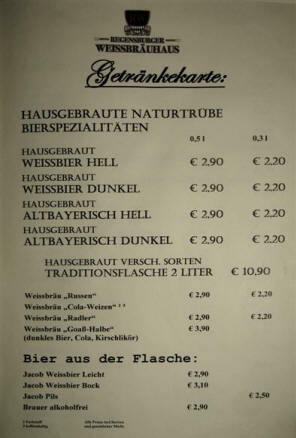 We walked to find the Brauhaus, but it didn't look good to us, so we continued on. At 8:15 we decided to sit down at Alte Kuchl am Königshof [Am Königshof 2, +49-(0)941-599-8530] and I had a Hohenthanner pils which was very good and Marcia had a local wine. This is where I started collecting German beer glasses and steins because they gave me one of theirs for free. 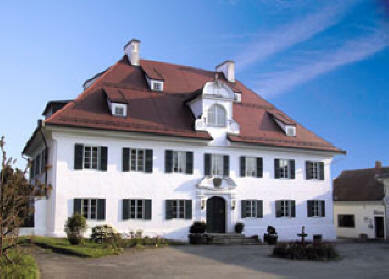 Below left is a photo of the brewery (the Schloss der Brauerei) for Hohenthanner beer. This place was cute, but rather quiet being off in a back street. So we decided to walk around and pick another place to eat and at 9:30 we settled on Regensburgern Weissbräuhaus [6 Schwarzebären Straße, +49-(0)941-599-7703.] There was a lively crowd eating and drinking on the patio but the inside restaurant was empty. 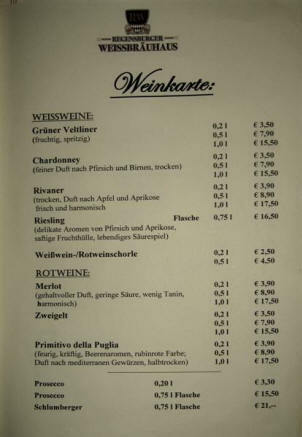 I ordered a Altbayerisch Hell or Old Bavarian light beer from the tap and Marcia had a German Chardonnay. Then we poured over the menu. Marcia had a hard time deciding what she wanted but by the time it got dark, she finally gave me that smile and we ordered. 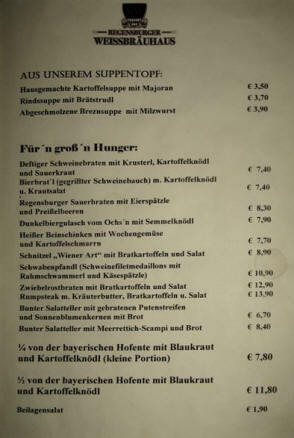 Marcia had a dinner of hot Bavarian Ham with potatoes and cabbage (below left.) I ordered another glass but this time of dunkel (dark) beer followed by a starter of their Dunkelbiergoulash von Ochs (dark beer goulash of ox) (below right) which was incredibly good; chunks of ox meat just melted in your mouth. I then had a ½ roast duck with red cabbage and potato ball (Kartoffelknödl.) Everything was very good except I just can't stand these sticky gooey potato balls and must remember to ask for something to replace them next time. This was a great meal for me. It was almost midnight when we left there and we wandered back to the hotel but for some reason went nuts to have a McDonalds vanilla cherry sundae for dessert and we did. Rarely do we stray from the local cuisine, but this was one of them. It was great and only cost €1.50. The hotel was next door to the McDonalds and when I got to the room I decided to watch CNN for a while and then fell asleep at 1 AM.